Jennymount Mill is located just off York Road, on North Derby Street, an area that once showcased the extent of Victorian industry in this part of Belfast. Other buildings of the time such as Gallaher’s York Street Tobacco Factory have long been demolished, leaving Jennymount Mill one of the few intact industrial buildings still standing as a relic of the great age of local industry associated with textiles. A familiar landmark when heading North on the motorway, the earliest buildings of Jennymount Mill date from 1856, but in 1864 the offices, engine house and chimney were constructed with John Lanyon as architect, who later in 1881 designed the Italianate Palazzo building, and local architect W.J.W. Roome later worked on further design in 1904. 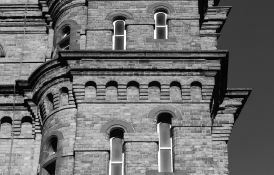 The Lanyon Building is a seven-storey red-brick Italianate tower block, likened to an Italian medieval palazzo with its battered base and its corbel course, supported by cast iron columns with fireproof floors of brick arches with concrete overlays. The complex also includes a two-storey office and engine house building that incorporates a striking and exceptional octagonal brick chimney stack rising from a three-storey return. It is unfortunate that this very visible part of the grouping remains derelict. 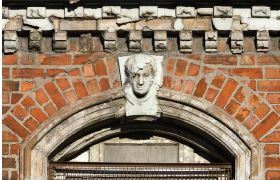 Contrast to the utilitarian structures on the site, sculptured keystone heads of historical and literary figures such as Wordsworth and Galileo from the renowned workshop of Fitzpatrick stone carvers imbue this building with a great sense of architectural vigor and quality. In 2002 Jennymount re-opened as an office block after a multi-million pound redevelopment scheme, but only 3 years later, in 2005, the complex was added to the Buildings at Risk register. Not as a result of its condition, but rather because of the difficulties associated with letting such a large amount of space in a part of the city which no longer flourishes around the textile industry. 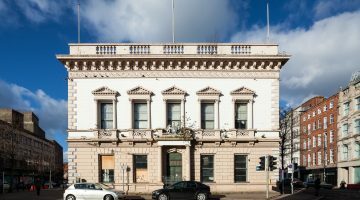 The location still carries some perceived legacy issues from the troubles, affecting the quality of life of those who live there and impacting on the amount of investment in the area. However, schemes such as the Strategic Regeneration Framework have highlighted that investment in the area would build confidence in investors and portray North Belfast in a positive light, for which Jennymount Mill could stand as an investment and community regeneration beacon. As their original purpose and use falls from favour, buildings like Jennymount Mill are susceptible to becoming derelict. However, industrial heritage assets have proved to be adaptable in the modern age and provide creative opportunities for a variety of end uses including residential and commercial options. With conservation minded restoration and adaption, these buildings can continue to enhance the built environment and fulfill new and productive roles, while serving as a tangible connection to the past. Conservation Without Frontiers: Fermanagh & Cavan. Full Programme Announced!